This article illustrates how to register a new device for users to record with, and assumes your account has available device licenses. If you need additional Device Licenses, please contact our Sales Team by emailing [email protected]. 3. 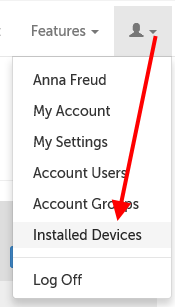 Click on the "Register New Device" button. 4. Enter a name to identify this new device (device names should be descriptive and unique). Then click "Register". This will generate a Device Key for you to use to install Local Hub on a new device. Device keys can only be used for one device; using the same keys on more than one device may result in recording corruption and loss.